The world after the Ice remains a dangerous place. Callum and David have survived the dragons but rebuilding lives is no easy task. When the army comes to their town to enforce an evacuation, Callum is suspicious about their claims of tainted groundwater and radiation. David feels he must join his family in defending the town, even if rebellion means deadly force is needed. Tragedy strikes when the Brethren, a crazed religious order, seeks to control the new world through not only preaching intolerance but forced conversion and torture as well. Can the love between these young men withstand not only distance but betrayal? Out of the Ashes by R.W. Day is finally out! This book is the sequel to A Strong and Sudden Thaw, an LGBT Fantasy/YA book I read and reviewed in August. If you read my review, then you know I loved that book and I've been looking forward to reading the continuation of David and Callum's adventures. Now it's finally here! You can find this book here or here. I've been looking for this release daily and then it was released while I was distracted with RL and looking away. *g* But I'm getting it NOW! I don't blame you for hiding the book, I don't know if I would have the will power to do so, lol! Isn't it a great feeling when a book you have been SO eagerly anticipating FINALLY comes out?! "...and you loved it? I'm going to assume you did... you devoured it, the way I did." Christine, yes it's wonderful! I didn't have to wait as long as others, so I'm lucky on this one, but YES! 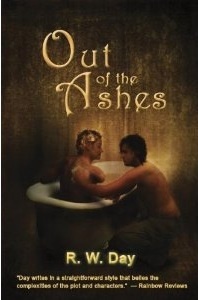 I just finished Out of the Ashes and I feel depressed and very disappointed. I would be interested to read your review of this book. Brit, I haven't had a chance to read this book yet! But I'm sorry you're depressed and disappointed after reading it. I'll certainly move it up on my list of books to read!